2.1 You're Going to Wear That? 2.2 Does This Make My Rear-End Look Big? Model some clothes for Elisif the Fair. Taarie has fashion advice and a job for you. Put on Radiant Raiment Fine Clothes. Introduce Radiant Raiment to Elisif the Fair. You're Going to Wear That? If you meet up with Taarie in Solitude, she will comment on your outfit: "If you're heading to the Blue Palace, you might want to rethink that outfit." You may ask her for some suggestions on what to wear to meet the jarl. Taarie's abrasive attitude toward you will change immediately. She will regard your meeting in the Blue Palace as an opportunity to introduce Radiant Raiment to Elisif the Fair. Taarie offers to pay you to wear one of Radiant Raiment's outfits when you speak to the jarl. She'll let you keep the clothes as well. 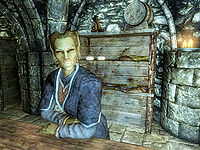 You may be skeptical of Taarie's sudden wellspring of good will; maybe she wants to make you look silly in front of the jarl. Taarie assures you that you cannot possibly look any sillier than you do right now, so go ahead and accept the offer. Does This Make My Rear-End Look Big? The Radiant Raiment Fine Clothes are added to your inventory with instructions from Taarie: "Try to get Elisif's opinion on it and if she likes it mention it's from Radiant Raiment." Equip the clothes and go speak with Elisif. Depending on your business at the Blue Palace, the conversation starter about your apparel can seem awkward. Yet, Elisif has an eye for fashion, even in the midst of turmoil. You may ask for her opinion on your outfit and she will tell you, "It's quite fetching actually. The craftsmanship is excellent." Tell her it was made by Radiant Raiment. She will be glad to put in a request for a few dresses quite soon. Return to Taarie and tell her that Elisif loved the outfit and that she'll be placing an order soon. Taarie will be quite happy with the result: "That's wonderful. You've done us a great service." You can keep the outfit as she promised and she will also give you some gold for your trouble. Objective 10: Speak to Elisif with Taarie's outfit on. Objective 20: Tell Taarie what Elisif said about the outfit. The following empty quest stages were omitted from the table: 0, 30, 200. On the PC, it is possible to use the console to advance through the quest by entering setstage SolitudeFreeform02 stage, where stage is the number of the stage you wish to complete. It is not possible to un-complete (i.e. go back) quest stages, but it is possible to clear all stages of the quest using resetquest SolitudeFreeform02.